In internal combustion engines, water injection, also known as anti-detonant injection (ADI), can spray water into the incoming air or fuel-air mixture, or directly into the cylinder to cool certain parts of the induction system where "hot points" could produce premature ignition. In jet engines it increases engine thrust at low speeds and at takeoff. Water injection was used historically to increase the power output of military aviation engines for short durations, such as dogfights or takeoff. However it has also been used in motor sports and notably in drag racing. In Otto cycle engines, the cooling effects of water injection also enables greater compression ratios by reducing engine knocking (detonation). Alternately, this reduction in engine knocking in Otto cycle engines means that some applications gain significant performance when water injection is used in conjunction with a supercharger, turbocharger, or modifications such as aggressive ignition timing. Depending on the engine, improvements in power and fuel efficiency can also be obtained solely by injecting water. Water injection may also be used to reduce NOx or carbon monoxide emissions. Water has a very high heat of vaporization. As the ambient temperature water is injected into the engine, heat transfers from the hot cylinder head and intake air into the water. This makes it evaporate, cooling the intake charge. A cooler intake charge means it is more dense (higher volumetric efficiency) and also has a lower tendency to knock. However, the water vapor displaces some air, negating some of the denser intake charge benefit. Knocking is generally more of a problem in forced induction engines rather than naturally aspirated, so this can help prevent it. On electronic ignition systems the ignition timing is generally retarded to prevent knock from occurring but with water injection it can be advanced closer to maximum brake torque (MBT) timing for additional power. Many water injection systems use a mixture of water and alcohol (often close to 50/50), with trace amounts of water-soluble oil. The water provides the primary cooling effect due to its great density and high heat absorption properties. The alcohol is combustible, and also serves as an antifreeze for the water. The main purpose of the oil is to prevent corrosion of water injection and fuel system components; it may also assist in engine lubrication when running in a high power state. Because the alcohol mixed into the injection solution is often methanol (CH3OH), the system is known as methanol-water injection, or MW50. In high performance automotive applications some tuners[who?] use 100% methanol as opposed to a water-methanol mixture and then referred to simply as "methanol injection". Safety concerns and part longevity concerns keep this as a controversial option. [according to whom?] In the United States, the system is also commonly referred to as anti-detonant injection, or ADI. In a piston engine, the initial injection of water cools the fuel-air mixture significantly, which increases its density and hence the amount of mixture that enters the cylinder. The water (if in small liquid droplets) may absorb heat (and lower the pressure) as the charge is compressed, thus reducing compression work. An additional effect comes later during combustion when the water absorbs large amounts of heat as it vaporizes, reducing peak temperature and resultant NOx formation, and reducing the amount of heat energy absorbed into the cylinder walls. This also converts part of combustion energy from the form of heat to the form of pressure. As the water droplets vaporize by absorbing heat, they turn to high pressure steam. The alcohol in the mixture burns, but is also much more resistant to detonation than gasoline. The net result is a higher octane charge that supports very high compression ratios or significant forced induction pressures before onset of detonation. Certain other engines can benefit far more from the use of water injection. Typical pulse jet engines have extremely poor fuel efficiency, specific fuel consumption, and thrust. Water injection has been proven to use the waste heat that causes a pulse jet to glow red hot and convert it into thrust. It cools the engine, it pulls more air in, and it reduces pollution. Water injection and other means of boost may be able to transform the pulse jet from a noisy, inefficient tube to a cleaner burning and powerful enough engine that may be of use in lightweight aircraft. Fuel economy can be improved with water injection. Depending on the engine, the effect of water injection, with no other modification, like leaning out the mixture, may be quite significant. In some cases water may also reduce CO emissions. This may be attributable to the water gas shift reaction, in which CO and H2O shift to form CO2 and H2. However, water may also increase hydrocarbon emissions, possibly due to an increased quenching layer thickness. Control over the water injection is important. It must be injected only when conditions within the engine would otherwise be sufficient to cause detonation or other undesirable effects. This normally occurs when the engine is heavily loaded and running at full power, however may occur outside of these times in specialized engines or applications. Otherwise injecting water cools the combustion process unnecessarily, resulting in negative effects such as reduced efficiency or power. Direct injection of water is possible and is likely advantageous. In a piston engine, this may be done at any point in the engine's cycle, depending on the desired effect, even late in the power stroke or during the exhaust stroke when used only to reduce engine temperatures. Most modern consumer vehicle engines are pre-programmed with specific fuel-to-air ratios, so introducing water without re-programming the car's computer or otherwise changing these ratios will most likely provide no benefit, and may likely reduce performance or damage the engine. In addition, most modern fuel systems cannot determine that water in any form has been added, and cannot determine a new compression ratio or otherwise take advantage of lower cylinder temperatures. In most cases in pre-programmed cars, introducing water vapor via an indirect water injection method causes loss of power because the water vapor takes the place of air (and fuel in engines with either a carburetor or single point injection) that is required to complete the combustion process and produce power. Normally, only vehicles re-tuned for water injection see any benefits. Damage can occur to the engine if too much water is injected or if the injector itself malfunctions. Water is not compressible, and too much water in the cylinder prior to, or during, the compression cycle can cause a condition called hydrolock, where the volume of liquid in the engine is close to or greater than the volume between piston and head (or between pistons in a opposed piston engine) of the engine at top dead center, resulting in extremely high cylinder pressure that may cause blown heads, shattering of the piston, connecting rods or other damage to the engine. This damage is normally fatal to the engine and typically requires a full rebuild or engine replacement. Water injection is typically used in aviation and was not initially intended for use in consumer grade vehicles. When used in consumer grade vehicles it is normally for the extremely high performance arena (1000 HP+) where vehicles are supercharged or turbocharged and produce excessive heat. These vehicles are typically driven only in an event or controlled race and require extremely high levels of knowledge to maintain and are only driven for very short distances. In most forms of water injection, water is mixed with a combustible fuel rather than being used in isolation. Many product scams exist touting that inserting a tube of misting spray into an intake manifold increases mileage or horsepower. However, unless the user reprograms the car's ECU or performs major modifications to the engine, power loss and damage may eventually occur. Water injection has been used in both reciprocating and turbine aircraft engines. When used in a turbine engine, the effects are similar, except that normally preventing detonation is not the primary goal. Water is normally injected either at the compressor inlet or in the diffuser just before the combustion chambers. Adding water increases the mass being accelerated out of the engine, increasing thrust, but it also serves to cool the turbines. Since temperature is normally the limiting factor in turbine engine performance at low altitudes, the cooling effect lets the engine run at higher RPM with more fuel injected and more thrust created without overheating. The drawback of the system is that injecting water quenches the flame in the combustion chambers somewhat, as there is no way to cool the engine parts without also cooling the flame. This leads to unburned fuel out the exhaust and a characteristic trail of black smoke. Piston-engined petrol military aircraft used water injection technology prior to World War II to increase takeoff power. This was used so that heavily laden fighters could take off from shorter runways, climb faster, and quickly reach high altitudes to intercept enemy bomber formations. Some fighter aircraft also used water injection for a boost in short bursts during dogfights. As a general rule, the fuel mixture is set at full rich on an aircraft engine when running it at high power settings (such as during takeoff). The extra fuel does not burn; its only purpose is to evaporate to absorb heat. This uses fuel faster and also decreases the efficiency of the combustion process. By using water injection, the cooling effect of the water lets the fuel mixture run leaner at its maximum power setting. Many military aircraft engines of the 1940s utilized a pressure carburetor, a type of fuel metering system similar to a throttle body injection system. In a water-injected engine, the pressure carburetor features a mechanical derichment valve that makes the system nearly automatic. When the pilot turns on the water injection pump, water pressure moves the derichment valve to restrict fuel flow to lean the mixture while at the same time mixing the water/methanol fluid into the system. When the system runs out of fluid the derichment valve shuts and cuts off the water injection system, while enriching the fuel mixture to provide a cooling quench to prevent sudden detonation. The extra weight and complexity added by a water injection system was considered worthwhile for military purposes, while it is usually not considered worthwhile for civilian use. The one exception is racing aircraft, which focus on making a tremendous amount of power for a short time. In this case, the disadvantages of a water injection system are less important. Water injection use in turbine engines has been limited, again, mostly to military aircraft. 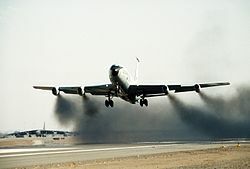 Many pictures are available of Boeing B-52 takeoffs that clearly show the black smoke emitted by turbine engines running with water injection. For early B-52s, water injection was seen as a vital part of take-off procedures. For later versions of the B-52 as well as later turbine-powered bombers, the problem of taking off heavily loaded from short runways was solved by the use of more powerful engines that had not been available previously. The BAC One-Eleven airliner also used water injection for its Rolls-Royce Spey turbofan engines. Filling the tanks with jet fuel instead of water led to the Paninternational Flight 112 crash. A limited number of road vehicles with forced induction engines from manufacturers such as Chrysler have included water injection. The 1962 Oldsmobile F85 was delivered with the Fluid-Injection Jetfire engine, which, incidentally, shares the title of "the world's first turbocharged road car" with the Corvair Spyder. Oldsmobile referred to the water/alcohol mixture as 'Turbo-Rocket Fluid'. Saab offered water injection for the Saab 99 Turbo. With the introduction of the intercooler the interest in water injection to prevent detonation almost disappeared, but recently water injection has also been of interest because it can potentially decrease nitrogen oxide (NO) and carbon monoxide (CO) emissions in exhaust. However the most common use of water injection today is in vehicles with high performance aftermarket forced induction systems (such as turbochargers or superchargers); such engines are commonly tuned with a narrower margin of safety from detonation and hence benefit greatly from the cooling effects of vaporized water. In 2015 BMW has introduced a version of their high performance M4 coupe, the M4 GTS, that combines water injection with intercooling. The car was featured in the 2015 MotoGP season as the official safety car for the series and was released for the commercial market in 2016. Bosch, which co-developed the technology, offers a water injection system named WaterBoost for other manufacturers. The company claims up to 5% increase in engine performance, up to 4% decrease in CO2 emissions and up to 13% improvement in fuel economy. A 2016 study combined water injection with exhaust gas recirculation. Water was injected into the exhaust manifold of a diesel engine and, by opening the exhaust valve during the induction stroke, the injected water and some of the exhaust gas was drawn back into the cylinder. The effect was to reduce NOx emissions by up to 85% but at the cost of increased soot emissions. ^ Kroes, M; Wild, T (1995). Aircraft Powerplants (7th ed.). Glencoe. p. 143. ^ Nour, M; Kosaka, H; Abdel-Rahman, Ali K; Bady, M (2016). "Effect of Water Injection into Exhaust Manifold on Diesel Engine Combustion and Emissions". Energy Procedia. 100: 178–187. doi:10.1016/j.egypro.2016.10.162. This page was last edited on 25 April 2019, at 09:40 (UTC).